Cooking Light launches a nationwide search to find the chef with the healthiest and most innovative cooking approach. The contest, searching for a self-taught or professionally-trained chef, launches today at www.CookingLight.com/castingcall. It runs through August 14, 2010. Entrants must submit a three-minute prep-to-plate video of a healthy, original recipe on which they will be judged. Four finalists will be chosen from the entries to compete in a live cook-off event at The Taste of Atlanta, a two-day outdoor food festival in Atlanta, GA, on October 23 and 24, 2010. The Cooking Light judges will select the winner, who will be named the “Healthy Chef of the Year.” The winner will receive a $10,000 prize package including a kitchen makeover, a year’s worth of free groceries, and the opportunity to become a contributor to Cooking Light magazine and CookingLight.com in 2011. Any and all skill levels are welcome to enter, from home cooks to culinary school graduates. Entrants must be legal residents of the United States and 21 years or older at the time of entry. Anyone who is paid to cook for a living is not eligible to enter. a) It is widely known that Mediterranean diet has high fat content. Is weight loss still possible if people will follow this kind of diet? To some extent, Mediterranean diet really has a high fat content. But you have to take note that the fat content of a Mediterranean diet consists of monounsaturated and polyunsaturated fats. These fats are essential and healthy for your body unlike the saturated fat which is common in American diet. Do take note also that calorie intake is the determining factor for weight loss and not fat consumption. If you follow the Mediterranean diet, you will enjoy lots of healthy benefits but you still need to lower your daily calorie consumption to achieve weight loss. b) What makes Mediterranean diet different from American diet? Mediterranean diet includes plenty of healthy food choices like vegetables, olive oils, nuts, cereals, potatoes, breads, and many more. It does not focus on red meat, eggs, and poultry products which are the common component of the typical American diet. c) Is it true that Mediterranean diet played a major role in lowering the rate of heart disease in the region? d) Is exercise still required if one is following a Mediterranean diet? Exercise is always essential no matter what type of diet you follow. The best thing about the Mediterranean diet is that it encourages daily regular exercises as part of the holistic approach to achieve a healthy lifestyle. When this type of diet was introduced in the sixties, exercise and physical activities were already part of the culture of the Mediterranean people. For your minimum exercise needs, you have to take a daily one-hour walk and weekly full body exercise. e) Is Mediterranean diet different from Low Carb diet? There is a sea of difference between these two diets. With the Mediterranean diet, your protein consumption would be lower. Normally, you will get 15 percent of your calorie consumption from the protein content of a Mediterranean diet. f) People observed that wine is included in the Mediterranean diet. What is the daily recommended amount for wine consumption? For your general guidance, you have to consume wine in low to moderate amounts. For male dieters, your daily calorie consumption from wine should be 5 percent. For women, it should be lower or about 2.5 percent. The Mediterranean lifestyle is your way to achieve good health. You need to include foods in your diet that are rich in Omega 3, root crops, and vegetable oils. Combine these with breads, cereals and fruits and you can prevent heart disease. About the Author – Eva Alexander writes for http://mediterraneandiet.org.uk/”>mediterranean diet plan, her personal hobby blog focused on tips to eat healthy on the Mediterranean way. You need a little fat in your diet for good health. Oils and fats supply energy, carry flavors, and help your body absorb fat-soluble vitamins, like vitamins A, D, E, and K. But make sure it’s the right kind of fat unsaturated. Limit your intake of saturated and trans fats, which can negatively impact your cholesterol, thereby increasing your risk of high blood pressure, heart attack, and stroke. Canola oil has the least amount of saturated fat of all common cooking oils – half that of olive oil – and it is free of trans fat and cholesterol. Canola oil has a high smoke point (heat tolerance) and a neutral taste, so is perfect for just about every culinary application. We are giving away a copy of “The Heart-Smart Diabetes Kitchen: Fresh, Fast, and Flavorful Recipes Made with Canola Oil.” This cookbook was developed by CanolaInfo and the American Diabetes Association (ADA) and is filled with healthy, delicious and easy recipes. Seven bloggers from the CanolaInfo team prepared all 151 recipes. Each blogger has a different life perspective to offer — some with culinary expertise, some married with children and others young career-focused urbanites still learning their way around the kitchen. While culinary levels in this group vary, they all want to share one message: Healthy cooking is for everyone! 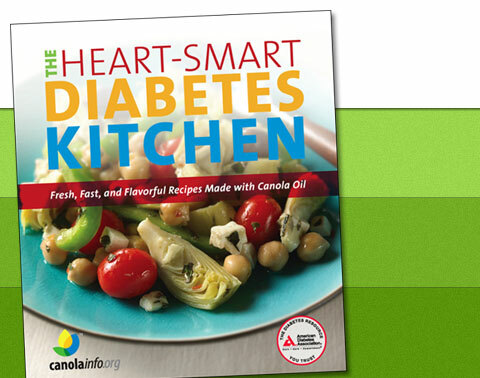 All 151 recipes in “The Heart-Smart Diabetes Kitchen” are made with healthy canola oil. All proceeds from the cookbook go to the ADA. The “Heart-Smart Diabetes Kitchen” is available from the ADA online store and in bookstores – but you can win a copy today – just go to our main blog page https://heartstrong.wordpress.com/ and click on follow my blog under networked blogs – one lucky subscriber will win a free copy of “The Heart-Smart Diabetes Kitchen” cookbook. Drawing will be held on June 30, 2010 so sign up today! 1. Combine all ingredients, except water and sugar, in a shallow pan, such as a 9-inch, deep-dish glass pie pan; set aside. 2. Bring water to a boil over high heat in a small saucepan. Add sugar and cook until sugar dissolves. Pour hot sugar mixture over fruit mixture, and toss gently, yet thoroughly, to blend. Let stand 30 minutes. 3. Sauce can be served on melon slices, banana slices, fat-free ice cream, angel food cake, waffles, or French toast. Yield: 12 servings. Serving size: ¼ cup sauce. The Egg Controversy: Healthy or Harmful? Eggs are a great source of protein, folate, riboflavin, choline, vitamin B12, A, D, and K. So why have eggs gotten a bad wrap? In the 1970’s the American Heart Association recommended decreasing the consumption of eggs and other sources of cholesterol to help decrease the risk of heart disease. But the relationship between egg cholesterol, increased blood cholesterol and heart disease is still not clearly understood. 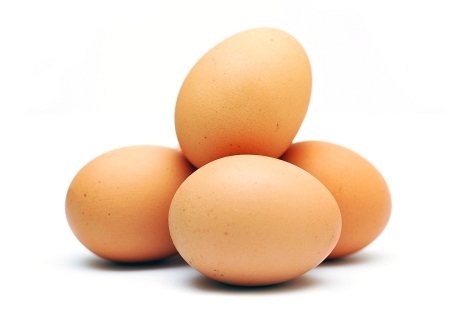 Studies have reported that consuming eggs can increase blood cholesterol levels in SOME people but not everyone. The interesting finding is that egg cholesterol was found to increased LDL (bad) cholesterol levels and increase HDL (good) cholesterol levels. Also in some people egg cholesterol promotes the formation of large LDL cholesterol particles, which are better than small LDL particles and are less likely to cause plaque formation (narrowing in blood vessels). Researchers believe that genetics, ethnicity, BMI and hormone status all may play a role in how eggs affect cholesterol levels differently in different people. The NHANES III observational study evaluated over 27,000 people and found that people who ate 4 or more eggs per week had significantly lower cholesterol levels than people who ate less than one egg per week. So what is the final word on eggs? We still do not have the answer…. Our recommendation is eggs are probably a healthy food source for most people IN MODERATION! A recent review of fish oil studies that have been performed over the past 30 years suggests that omega 3 fatty acids are beneficial for everyone (published in the Journal of the American College of Cardiology August 2009). Studies have found that healthy people as well as patients with heart disease (heart attack, congestive heart failure, atrial fibrillation) benefit from fish oils. Most of the positive health effects were found with trials using DHA and EPA, which are long-chain fatty acids. 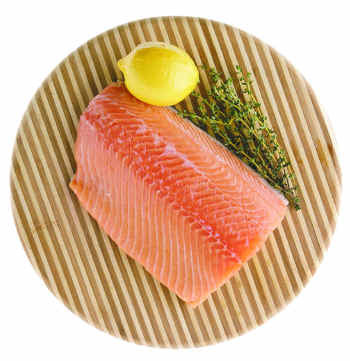 EPA and DHA are found in fatty fish and fish oil supplements. Not as much data is available on plant-based ALA which is found in flaxseed and other plants.